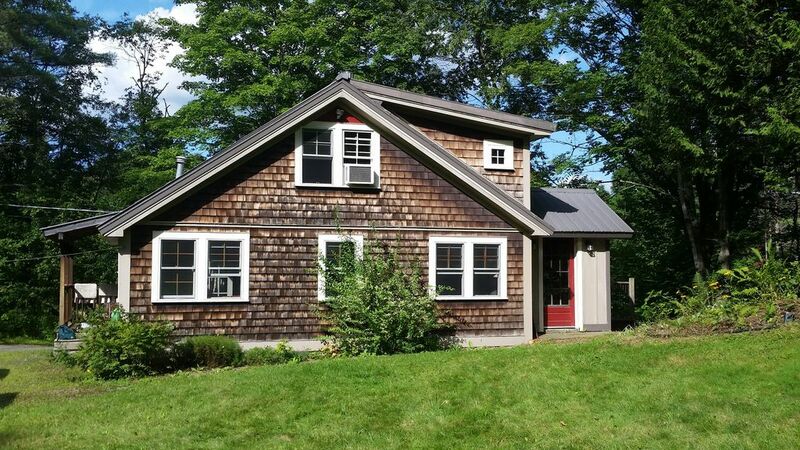 The Martini Cottage (we're the Martin family) is close to downtown Stowe with its art, shopping and restaurants. You’ll love it here because of the location (a 20 minute walk to town) mountain bike (or cross-country skiing) trails right from the road, beautiful local hiking and skiing and its cozy and quirky charm. In the wintertime we're close (1 mile) to a free shuttle stop that goes up the Mountain Road to Stowe Mountain. Or if you drive, the house is about 8 miles from the Stowe Resort. The house is two levels, with an upstairs bedroom and loft (each with a queen bed), and a downstairs bedroom with a pull-out double futon. There is a crib for kids, as well as lots of kid amenities (and we can probably supply something for you, so just ask). There is a deck with a gas grill, as well as a large yard for games or activities. Not to mention so many wonderful breweries nearby. Couples, adventurers, and families (with kids) will all be comfortable here. Window unit in upstairs loft. There is a portable DVD player that can be hooked up to a laptop (but you must bring your own laptop). games are located in the den bookcase or on the table up in the bedroom next to the futon. Also corn hole to use in the yard. There are some kids toys in the downstair living room and bedroom there are a few toys for kids. The house was very clean and had a nice kitchen. The host was very responsive. We would definitely stay here again! Very cozy home base for our first trip to Stowe. Great location right outside of Stowe village. Well equipped kitchen with cozy living room and great natural light! We had an awesome stay in Stowe at the Martini cottage. The location was great - super close to the downtown area with tons of restaurants and only about 15 minutes from Stowe Mountain for skiing. There is so much to do around the area and this place makes the perfect home base. We will definitely be back! We loved it. Just our speed. No tv and no blinds on most bedroom windows - we are up early people and loved it! Owners left house well stocked and welcoming. It does have a driveway up a hill and we had a lot of snow so it was challenging for our 4x4 but nothing out of the ordinary for a Vermont cabin. We had a lovely stay. So comfortable, clean, and cozy! On a nice quiet road - very peaceful! Pictures don’t do it justice.